1. I was accompanied by two friends. 2. It was a weekend trip to the lively, second largest city in Greece as opposed to the much quieter one day journey to Corinth. 3. It was also the weekend of my birthday. 4. I didn’t get hopelessly lost in the rain. I have explained in a previous post my devotion to Saint Paul and inspiration behind “walking in his footsteps” so to save from redundancy, I will not reiterate the saga here. 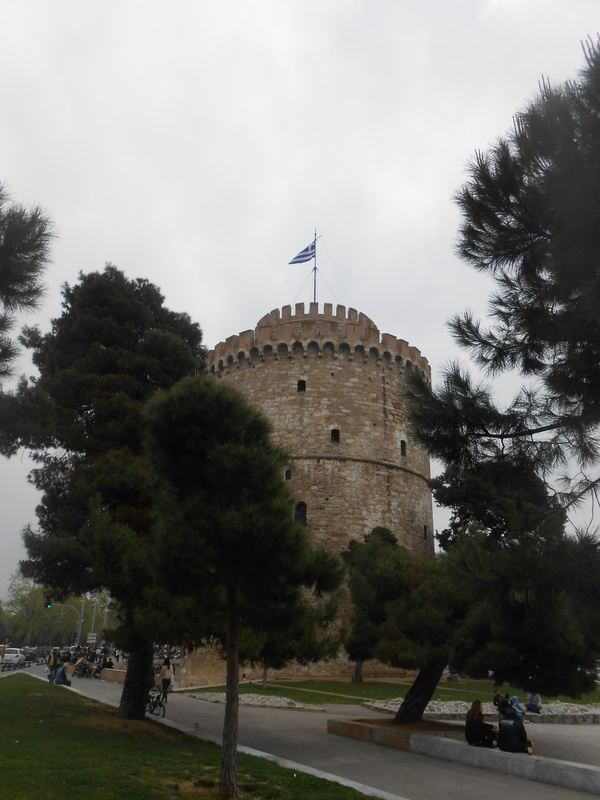 Instead, this is an attempt at a brief account of the weekend in Thessaloniki. Milica, Ben, and I began our trip by hopping on our midnight train (literally, we left at midnight) with the hopes of sleeping through the trip before arriving at our destination seven hours later. How silly the thought of sleep was. Although we were in a cabin, we shared it with a strangely controlling, stiletto-heeled, aged Jennifer Aniston look alike who was a fan of conversation. And even though we were initially ecstatic when we discovered that the seats reclined the instance of joy immediately faded along with the leg space. Not much sleep was had, but we eventually arrived at the Thessaloniki at about 6:00am. Unfortunately our hostel didn’t open until 8:00am so we took advantage of the time to help our tired bodies out with a little caffeine. Here comes a plug for our hostel. We stayed at Little Big House, a brother/sister-run business, and it was the BEST. 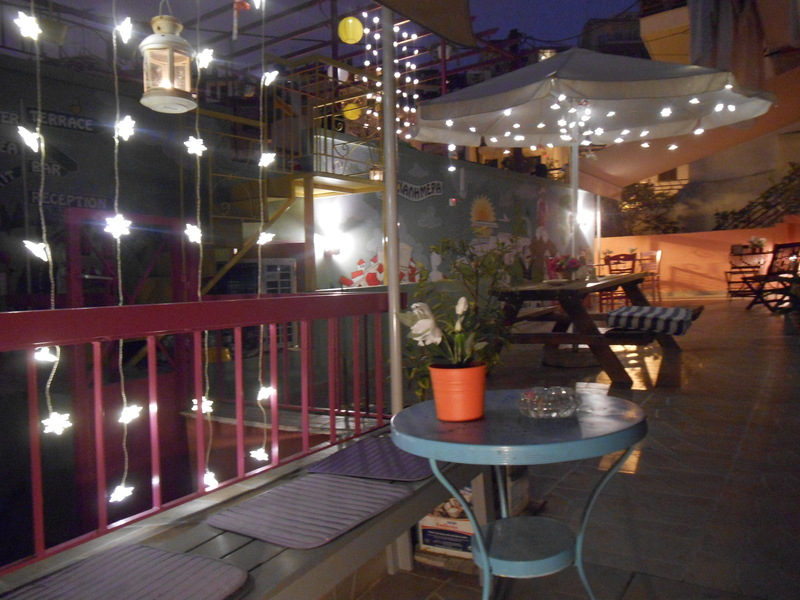 It was tucked away in the twisted streets but seemed to be a little oasis. The hosts were extremely helpful with everything we asked and provided such a beautiful, homey atmosphere. Just look at this patio! 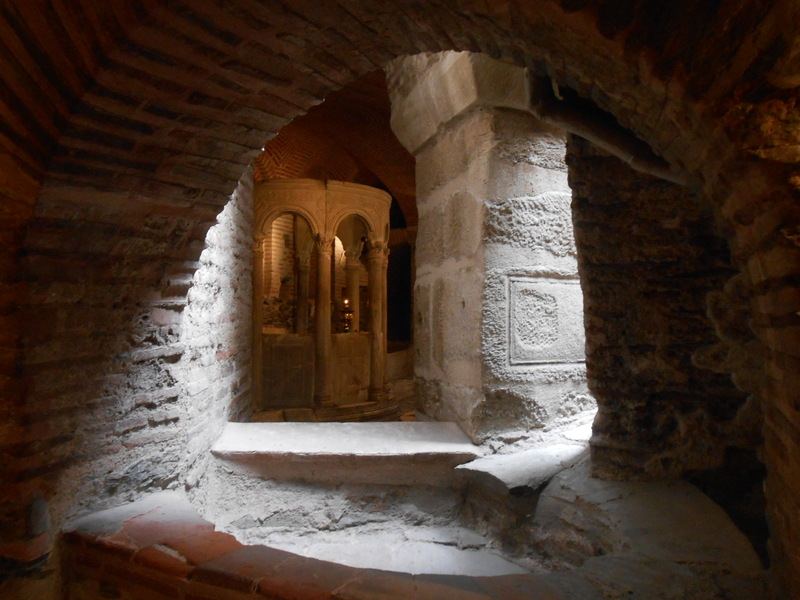 The well in the Crypt. Anyway, after drinking some more caffeinated beverages at the hostel, we set out to explore the city. 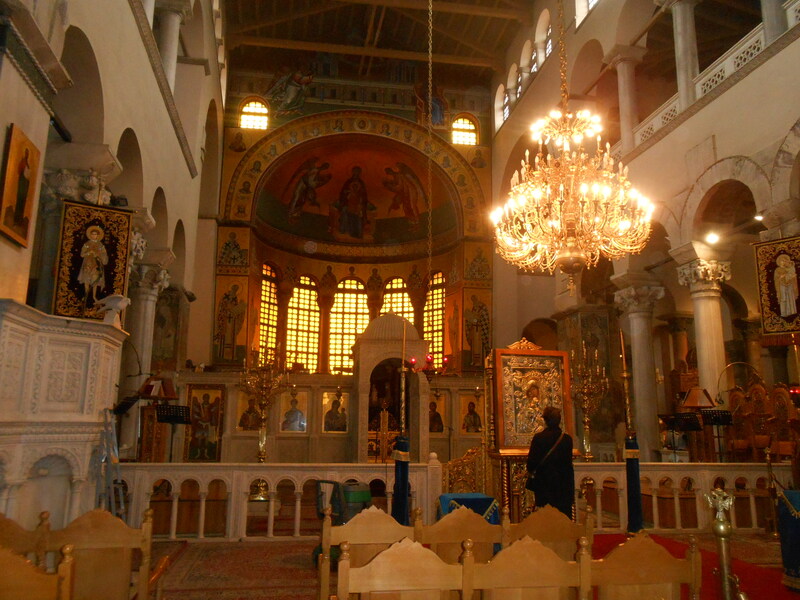 First stop, the byzantine style Church and Crypts of Saint Demetrius (Άγιος Δημήτριος). The Church was originally built on the ruins of a Roman bath in the late 4th century AD but fires lead to the reconstruction of the building that now stands in 7th century AD. The Roman baths hold the site where Saint Demetrius was imprisoned and executed in early 4th century AD. Unfortunately, our weekend seemed to be plagued by youths so a clear photo of the beauty of a church was near impossible. They are just sleeping, I promise. Next was my main attraction: the Roman Forum. Unlike the forum in Corinth, this one was smack dab in the middle of the modern city. I didn’t have to take a separate bus to find it and I definitely didn’t need to wander around in the rain trying to struggle through a Greek conversation. We found it easily and were apparently the only ones interested in it because we had the place to ourselves. While the Roman Forum existed during Paul’s time, he never preached in it. He did so in the synagogues which led to some angry Thessalonians who forced Paul and his companions out of the city. 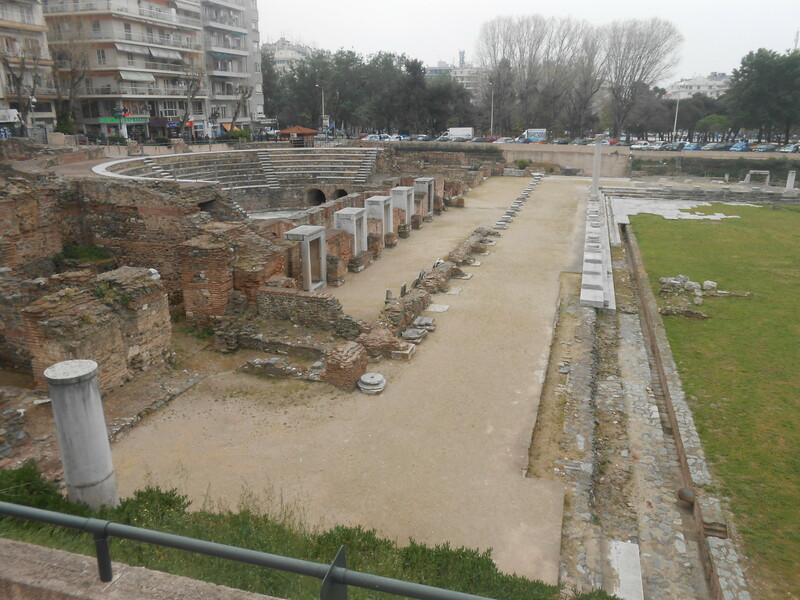 It is because of this and the fact that the Modern city of Thessaloniki is built directly on top of the Ancient site that “walking with Saint Paul” is very difficult. Nonetheless, the experience was moving. 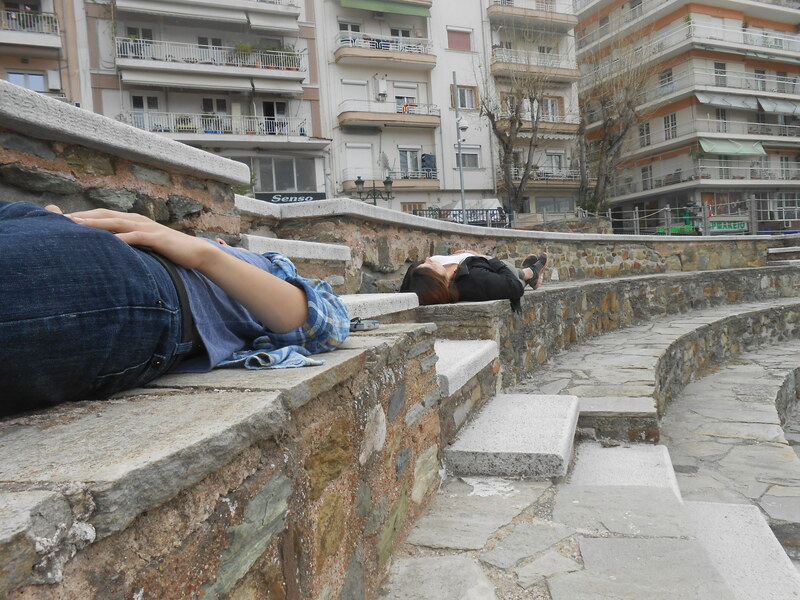 After exploring the museum, we went to rest in the Odeion (a theater structure) where I read and Milica and Ben closed their eyes for a bit. It was quite peaceful to sit there and be engrossed in Saint Paul’s letter to the Thessalonians while the hustle and bustle of the city continued around us. Spoiling the mood slightly, was an employee who was not too thrilled about people napping in an archaeological site. The whole situation got awkward (and entertaining due to Milica’s snarky comments such as “Am I not allowed to meditate?”) pretty quickly so we set off for a new destination, kissing the forum goodbye. The White Tower was our next destination. This was constructed by the Ottomans sometime after 1430 and was used as a fort, garrison, and prison. 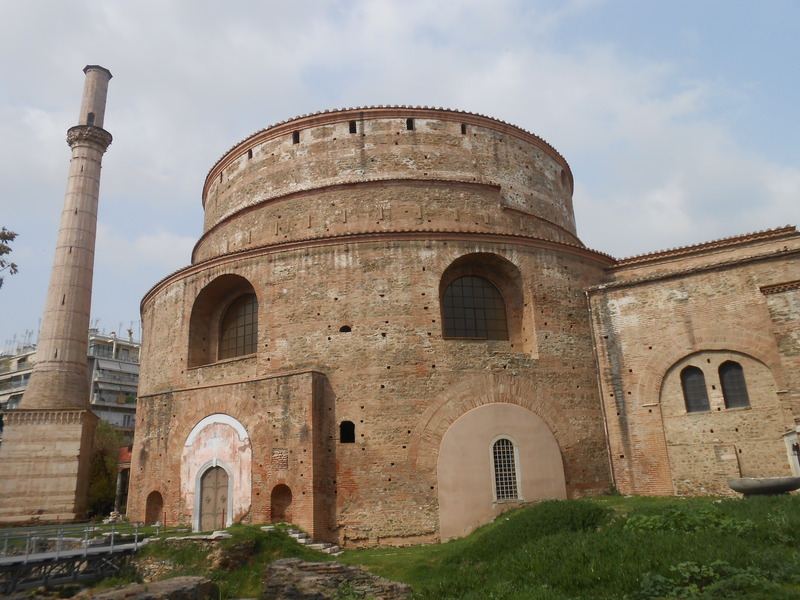 It was nicknamed the “Tower of Blood” and “The Red Tower” because of the dark uses but when Thessaloniki was separated from the Ottoman Empire in 1912, the tower was white-washed to symbolize the purification. And so the name “White Tower” came to be. There is a museum inside as you walk up to the top. Everything was in Greek so the three of us got fancy listening devices to listen to the descriptions in English. As you can imagine, we fit in really well. With our lack of patience demonstrated in the White Tower museum as an indicator of our hunger, we found a taverna for lunch. Tasty and enjoyable as usual. With full stomachs we head back to the hostel for nap/quiet time. Later that night we met up with our three other friends/peers (Annie, Christina, and Greg) who were in the city for a field study. After being separated for almost two days, we were all quite happy to be reunited for an evening of wandering the city. The following day I separated from Milica and Ben in order to visit the Archaeological Museum and the Museum of Byzantine Culture. Both museums were fabulous, however not for the weak of heart for there is a LOT of material to look at. So if you aren’t a big fan of museums, I would not suggest them back to back. 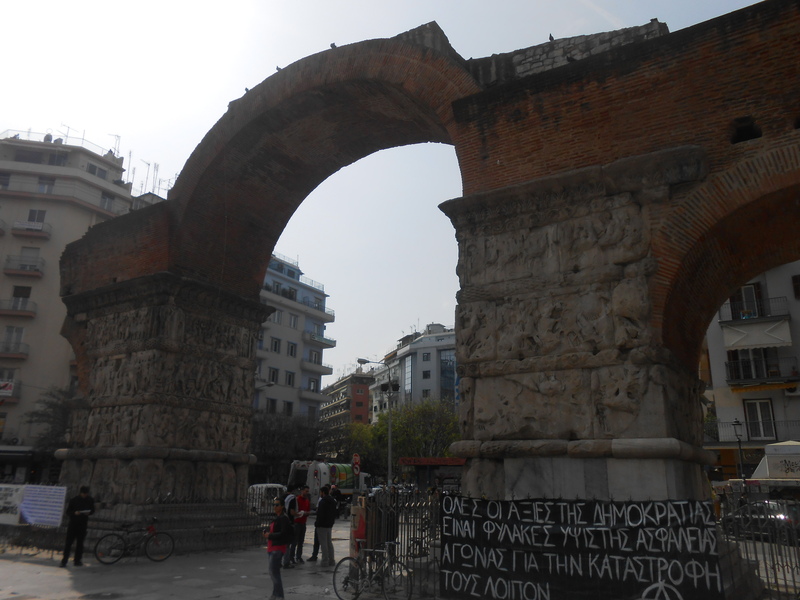 On my way through to find my comrades, I passed the Arch of Galerius. Galerius was an emperor in the late 3rd, early 4th century AD and commissioned this triumphal arch for himself in 299AD. It originally had three arches and depicted both victories and ritual processions. After a walk up to the old walls of the city, we headed back into town for dinner. We had a classic encounter with the “eyes are bigger than your stomach” issue when we ordered far more food than we could ever consume. 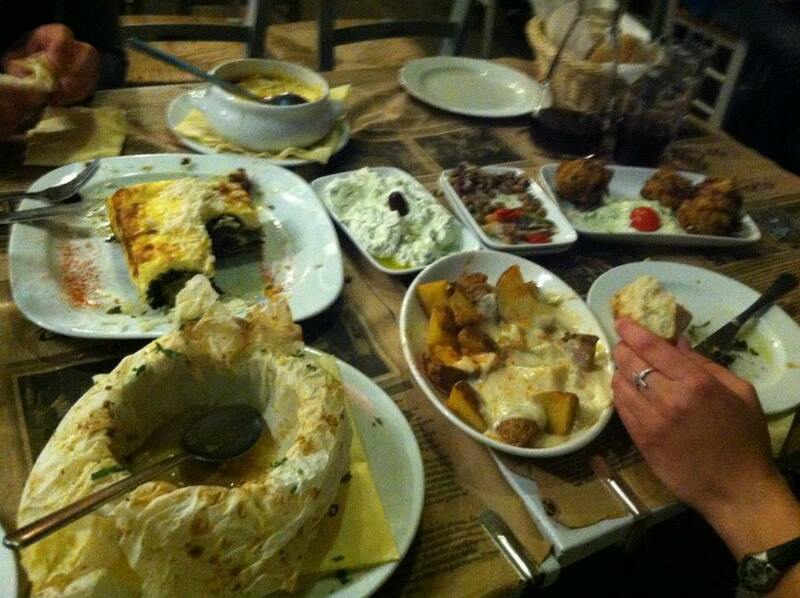 We had a beautiful loooooong Greek dinner filled with much laughter and capped off with a waiter singing the Greek birthday song to me. All in all, awesome. And so Sunday came. Not only are Sundays wonderful to begin with, but it is quite the blessing when your birthday falls on a Sunday during the Lenten season. Two years ago mine fell on Good Friday; a very different kind of birthday but both great gifts. Even cooler is knowing that I share a birthday with the inspirational Blessed Pier Giorgio Frassati. Milica and I headed to Mass in the morning and found our Church in the middle of the clubbing district. A shocking and beautiful contradiction. We stopped by the Rotunda for a look around. This was also constructed by Galerius but had many uses throughout the ages before it came to be the empty building it is today. From temple, to Christian basilica, to a Mosque, and then back to a Christian Church. Before beginning our journey home, we stopped to pick up some of Thessaloniki’s famous trigona (τρίγωνα) and some chocolate covered tsoureki (τσουρέκι). It was smooth sailing for two of us, but due to a lost ticket, Ben and I stared through the window (like in a movie) at Milica as our train moved out of the station. Don’t you worry though, she made it home just fine by bus. Thank goodness! However we did not get of scot-free as the vandals that were everywhere we went in Thessaloniki were on our train. Apparently they were on a school field trip. Somehow I made it through the hours and hours without slapping one of them. Like I said, clearly a very different adventure from my last pilgrimage following Saint Paul’s voyage. The city itself was lively and Modern, but if you let yourself be guided, you are brought to the simple beauties of reading in an archaeological site, laughing with friends, and discovering the loving embrace of Mary waiting for you in a graffiti-ed ally. For better or worse, I choose to approach every situation as an adventure with little information, zero expectations, and a whole lot of Faith. Our little courtyard with the Palamidi Castle in the background. The Acropolis from the Areopagus Hill. Socrates’ prison . . . or what is left. Can’t not have a picture of those fine caryatids. One of the three sections of the Erechtheion. Very uncharacteristic for a Classical temple. also, note the olive tree. 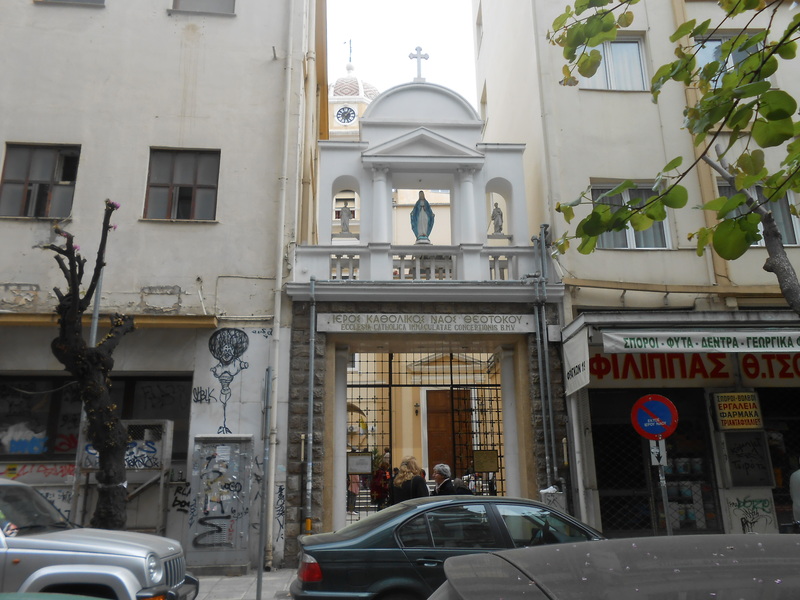 Bastion of Saint Andrew (Aγιος Aνδρεας).